This is a collection of the best WordPress themes for hair salon, day spa, beauty treatment, massage, barber, hair dressers and other health and beauty business websites. Below is a handpicked collection of 30+ of the best premium WordPress themes for hair salons, hairdressers, massage shops, beauty salons, day spas, manicure shops, beauty treatment businesses, tanning salons, and other health, beauty and wellness businesses. 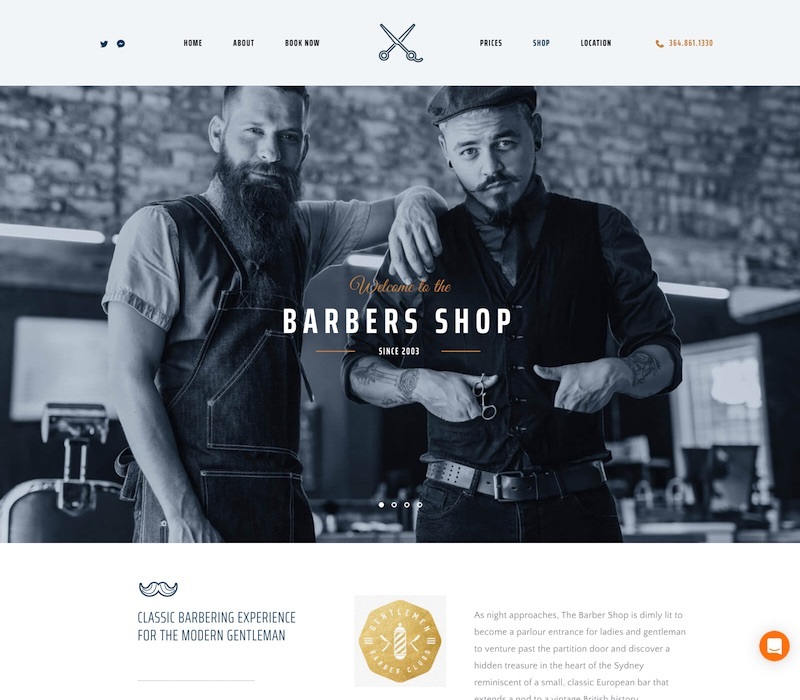 The Parlor is a WordPress theme created for hair salons, barbers shops, spas, health and beauty businesses, or wellness centres. The premium theme the Thusefuse has a modern and professional design and allows you to showcase your services, prices, and business information clearly. The Parlor design as well as many child themes comes free with a purchase of The Core theme – an excellent multipurpose theme from Themefuse. 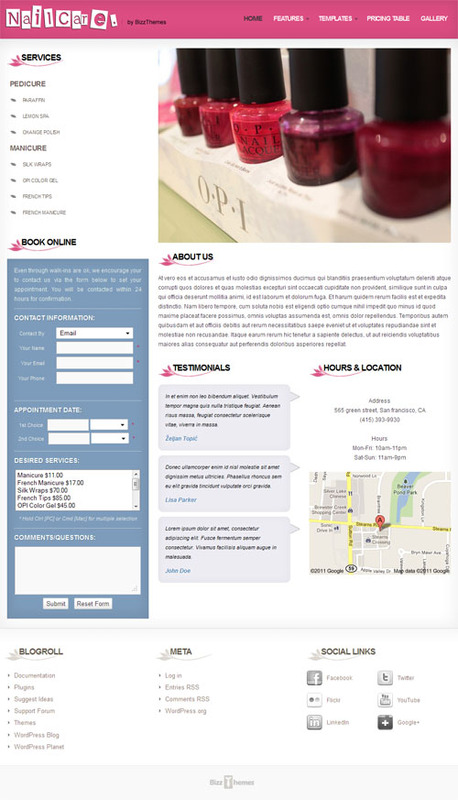 The Spa theme is a modern and professional theme for spa and beauty business websites. It’s a premade skin for the excellent Ultra theme from Themify. It features a service pricing page, gallery, online shop, contact page, and an email subscription tool. Salon is a great looking WordPress theme ideal for spa and beauty salons, hair salons, wellness centers, massage parlors and other small business websites. The premium theme from CSSIgniter has a modern and attractive design perfectly suited to the above niches with a structure that allows you to display your services, staff, products and other business information. Some of the key features and benefits of the theme include: fully mobile friendly responsive design, drag and drop modular homepage, flexible layout (select columns, filters, masonry layouts and much more), 5 content types (slider, services, personnel, photo galleries and video), WooCommerce support for ecommerce functionality, multiple color scheme options, powerful options for customization, translation ready, and more. Modena is a multipurpose responsive business WordPress theme from WPZOOM. The premium theme has a bold and modern design that would work well for small businesses such as beauty and hair salons, massage shops, nail salons, and others. The theme is fully mobile friendly and works on all devices. Some of the other notable features in the Modena theme include: a dynamic homepage builder (build and customize the homepage layout with widgets), full width slideshow, easy color styling, font options, WooCommerce support, featured services directory page, testimonials module, blog section and more. The theme is built on the advanced WPZOOM framework that allows you to easily control and customize the theme to suit your needs. 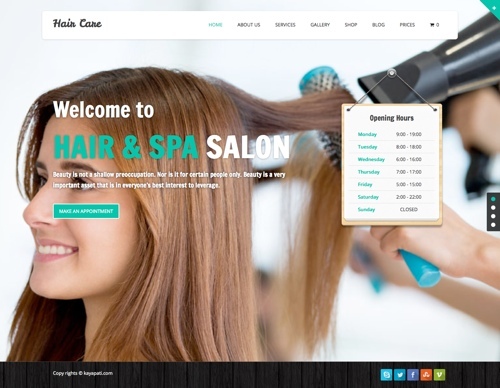 Hair Care Salon is a premium WordPress business theme from BizzThemes designed for hair salons or other service oriented small business websites. The professional theme allows you to easily showcase your products, services, location, staff, operation hours and customer testimonials. The theme also includes an integrated fully featured booking / appointment management system where you can accept, cancel and manage requests, and send out notifications via email. 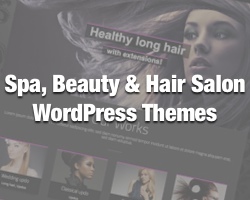 The Hair Care WordPress theme is a premium theme for beauty salons, hair salons, spas, beauty shops and related business. The theme has a lot of features and customization options. It has heaps of different homepage layouts to choose from with options to show a full screen image, video background, opening hours, open hours, pricing information, contact details and more. Some of the other key features of the theme include: theme customizer and page layout builder, mobile responsive design, parallax background effects, portfolio / gallery pages, Google fonts, WPML compatibility, WooCommerce support and more. Penelope is a beauty salon WordPress theme designed specifically for beauty salons, hair salons, spas, massage parlours, nail salons, cosmetic companies and other related businesses. The premium theme from 7Theme has an attractive and mobile friendly responsive design and comes with lots of features and options. You can easily show your services, staff, portfolio and testimonials in a great looking website. Zen is a salon and massage WordPress theme designed specifically for hair salon, massage, beauty salon, spas, wellness centres, and other related small businesses. The premium theme from 7Theme has a clean design a custom homepage layout that lets you display all your products and services in an attractive manner. Some of the other key features include: a mobile friendly responsive design, lots of theme options (to change colors, fonts, backgrounds etc), drag and drop slider, unlimited sidebars, portfolios and galleries, team and pricing templates and more. 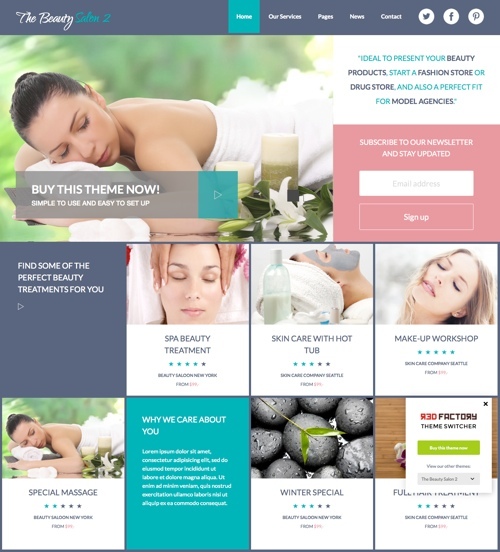 Dream Spa is a mobile responsive business WordPress theme suitable for spa, therapy, massage, yoga, wellness treatments, beauty salon and other similar websites. It has a refreshing organic colour scheme and nice design that allows you present your services in a professional manner. The theme has a custom homepage with a slider, and you can easily create pages for staff, blog, about, pricing, packages, services, partners, courses, contact, products, gallery and more. Some of the key features of the theme include: easy to admin options, mega menu with widget support, unlimited layout possibilities, treatments and shop pages, 6 colour styles, Google fonts, WooCommerce support, Google maps widget, one click demo install, a fully responsive design and more. 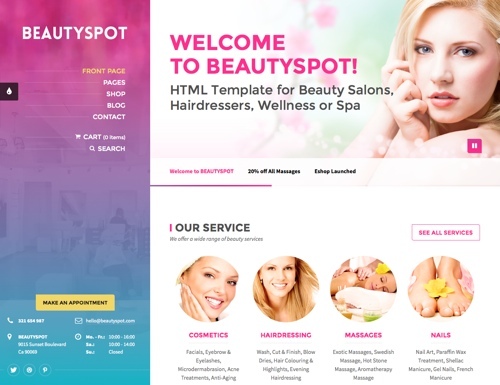 The Beauty Spot WordPress theme has a modern and unique design ideal for beauty salons, hair dressers, wellness centres, spa and other health and beauty business websites. The premium theme has a fixed left-hand menu / sidebar for the menu items and contact information, while the right section has a slider and sections for other information about your services. Some of the other notable features include: a reservation form, 8 colour schemes, WooCommerce support, page builder with drag and drop functionality, a fully responsive layout with retina graphics, coding with SASS, theme options and more. 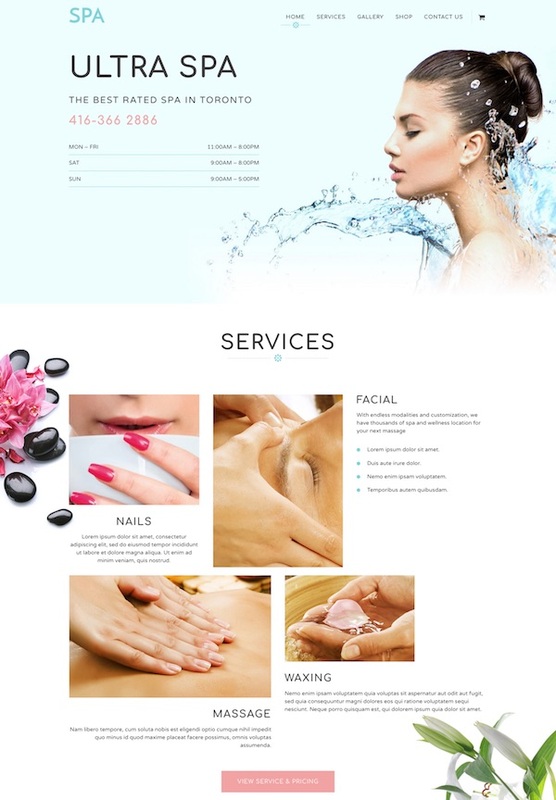 Nail Care is a premium WordPress business theme from BizzThemes designed for nail care salons, massage, spa, hair salons, beauty salons, tanning salons or any other service oriented or small business website. The professional theme allows you to easily showcase your products, services, location, operation hours and customer testimonials. The theme also includes a fully featured, integrated booking / appointment management system where you can accept, cancel and manage requests, and automatically send out notifications via email. The Face Art Theme is a WooCommerce WordPress theme built for cosmetic, spa and beauty, women and fashion websites and related online stores. The premium theme has a clean and fresh design and comes with 3 pre-made homepage layouts and options to create unlimited homepage possibilities. Some of the other key features include: WooCommerce integration, unlimited colours, slider revolution plugin, Font Awesome icons, different portfolio and gallery layouts, HTML5 and CSS3, multi-language support and more. Beauty Fit is a multi-purpose health and beauty WordPress theme ideal for spas, salons, beauty shops, health shops and others. The theme is created using Twitter Bootstrap and has a mobile responsive design that works on desktops, tablets and mobiles. Some of the notable features include: a 3D layered slider, WooCommerce support, page builder, boxed or wide layouts, light and dark colour options, multiple blog styles, appointment booking, multi-language support, Google fonts, a shortcode system, 22+ background patters, and more. 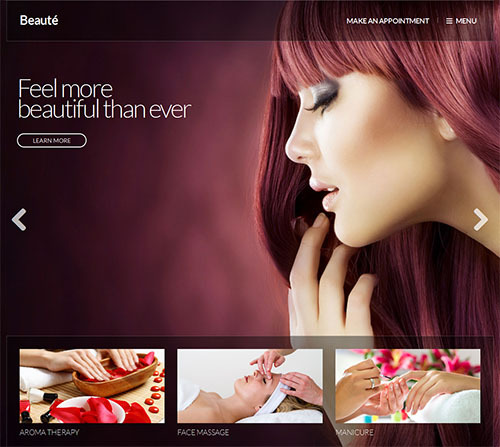 The Beauty Salon is a premium WordPress theme created for beauty, spa and health related websites. It has a unique tiled homepage for your products and services and comes with an easy to use tile builder. The theme is mobile friendly with a fully responsive design and is built with Twitter Bootstrap, HTML5 and CSS3. Some of the other notable features include: unlimited colour variations, wide design, custom fonts, flex slider, ready for multi-languages, image gallery, custom logo and more. Appointway is a simple responsive business WordPress theme with an integrated appointment booking system. The premium theme from Ink Themes is ideal for service businesses that want to have a professional online presence with the option for customers to book appointments and also pre-pay from their website. The theme would suit businesses such as beauty salons, spas, health treatments, massage therapists, or any other small business or service provider. The theme comes with an appointment booking system and form. It allows you to easily define the date and time slots for different services, automatically deliver emails on successful appointments, and collect payments. When viewed on mobile devices a “tap to call” button is also displayed so people have the option to easily call to make an appointment. The theme itself has a custom business oriented homepage design with featured slider and sections to showcase your services. It also has a section for your business address, open hours, Google map location and a place for testimonials. 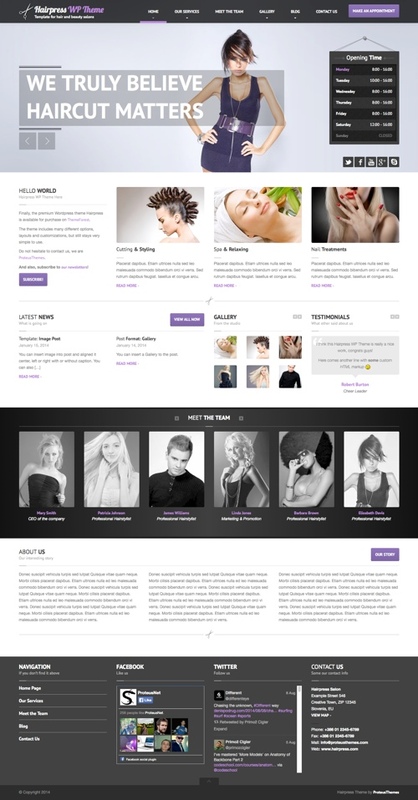 Beauty Center is a simple business style WordPress theme for hair and beauty salon websites. The theme has a mobile friendly responsive design and has a homepage with slider, multiple colour schemes, custom widgets, shortcodes, custom admin panel, photo gallery page and more. The Spalon WordPress theme is mobile friendly and designed for spa, beauty, massage businesses, hair salon, yoga classes, beauty treatment businesses and others. The premium theme includes all the necessary features required in a spa or salon website. Some of the notable features include: custom post types for pricelist, staff, gallery, and testimonials, 18 page templates, appointments form, unlimited colour options, theme options, WooCommerce support, social media profiles, custom widgets and more. Spa Salon is a business WordPress theme from Templatic designed for spa, salon, massage, or other service oriented business websites. The premium theme includes an integrated booking / appointment system that allows customers to book, manage and pay for appointments and services online. The admin can setup, manage and customise the booking system from the themes backend admin panel. Other features include 5 alternative colour schemes, 30 integrated shortcodes, 6 page templates, a design settings panel and more. The Hair Press WordPress theme has been created for hair salons, beauty salons, wellness centers and any similar small business websites. The premium theme has a mobile responsive and retina ready design and has a custom homepage with places to showcase your services, open times, latest news, testimonials, team members or staff and other information about the business. You can customise the theme via the WordPress Customizer and it is compatible with WooCommerce and WPML plugins. 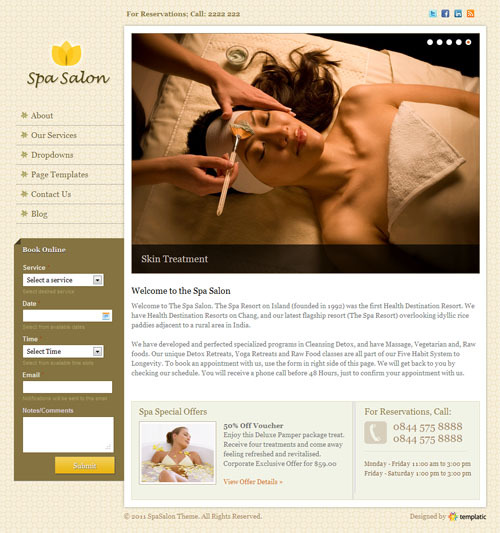 The Spa Salon WordPress theme is a mobile responsive theme for spa and salon business websites. The theme has a full screen image slider homepage and bottom navigation menu. It has a page builder and WordPress Customizer support to completely customize the layouts and colours on the fly. Some of the key features include: a services page, pricing page, portfolio gallery WooCommerce support for a shop section, parallax header images for pages, fluid or boxed layouts, video support, Google fonts, custom sidebars and more. 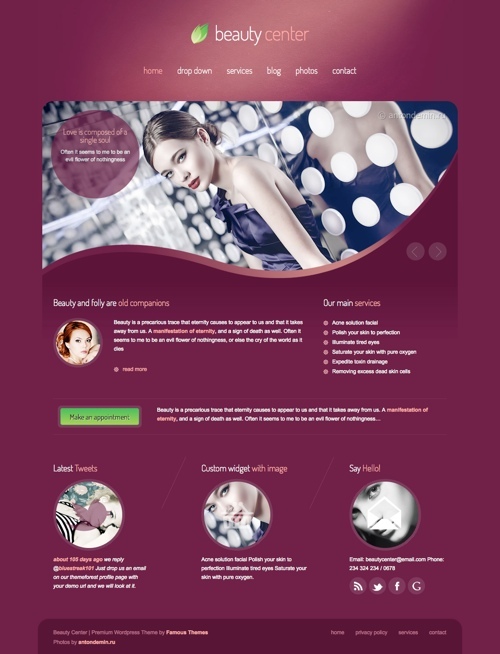 Beauty Spa is a flexible WordPress business theme for small business websites like hair and beauty salons. Some of the key features of the theme include: a mobile ready responsive design, full screen slideshow background for images or video, pages for prices and services, gallery portfolio, blog section, page builder, WooCommerce support for a shop, theme customizer, and more. Orquidea is a responsive WordPress theme with a funky and modern design ideal for hairdressers and hair salons. The premium theme has a lot of custom page templates specifically for business such as team page, services, singe service page, about, contact, open hours and more. Some of the other notable features of the theme include: options to customize everything (colours, fonts, layouts), 15 pre-made colour schemes, 600+ fonts, lots of shortcodes and widgets, advanced theme options and more. HairByDesign is a flexible and easy to use WordPress premium theme designed for hair salons, beauty salons, massage parlours, hairdressers, day spas, and other related small business websites. It has a lot of great features including: custom logo and favicon, custom backgrounds on each page / post, quick galleries, services and pricing page, team / staff page, unlimted sidebars / slideshows / colours, 100 shortcodes, 600 webfonts, admin options panel and more. Smart Booking is a business WordPress theme that comes with a complete appointment booking system (via a plugin). The premium theme from Ink Themes is designed to showcase your businesses effectively and the powerful appointment booking feature allows you to capture leads and your customers book appointments. It would be ideal for spas and salons, hair dressers, massage shops, personal trainers, dog trainers, doctors, dentists, beauticians, plumbers, electricians and other small businesses. The Smart Booking theme integrates the InkAppointment plugin allows your customers to make online appointments and bookings. It has schedule programming / time slots, email notifications, payment options and more. Some of the other key features of the theme itself include: and attractive slider, custom homepage, location and map, colour customizer, blog post formats, testimonials, retina and mobile responsive design, and more. 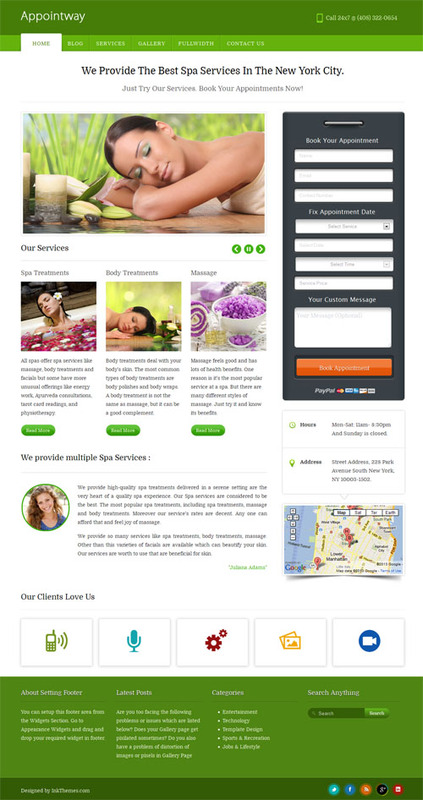 The Citrus Stone Spa WordPress theme is a responsive theme designed for any kind of spa, salon and beauty website. The premium theme has a clean and fresh design and nice homepage layout to present your business and services. Some of the notable features in the theme include: a custom homepage with slider, pages for services, staff, pricing and a blog, menu with icons, contact page, testimonials and clients sections, shortcodes, left or right sidebars and more. The Vital WordPress theme is designed specifically for health and beauty websites. Its perfect for spas, salons, hairdressers, health care, massage parlours, day spas, yoga, medical business, massage centre, beauty centre and beauty treatment businesses websites. Some of the notable features of the theme include: unlimited sections for services and business information, advanced typography options, custom background option for every page, customisable colours / fonts / background, mobile responsive layout, 100 shortcodes, unlimited sidebars and more. Spasalon is a multi-purpose WordPress theme with a mobile friendly responsive design built for spa, salon and beauty business websites. The premium theme has multiple nav menus, a unique and customisable homepage, featured slider, 7 page templates, custom post types, sections for products and services, staff and services templates, blog section, product and product details page templates, translation ready, multiple colour schemes and more. The Bellezza WordPress theme has a full screen background homepage design and left sidebar navigation. It has special pricing page and team / staff page. Some of the other key features include sliders and slideshows, customisation options (colours, backgrounds, fonts etc), custom logo and favicon, shortcodes and more. The Cut theme is a responsive WordPress theme suitable for hairdressers, beauty salons, massage parlours & day spas. It has a clean and simple black and white design that is fully customisable to suit your particular business. Some of the other notable features of the theme include: a filterable portfolio, price list page, admin options panel, Ajax contact form, 600 font options, mega menu, HTML5 and CSS3 coding, shortcodes and more. 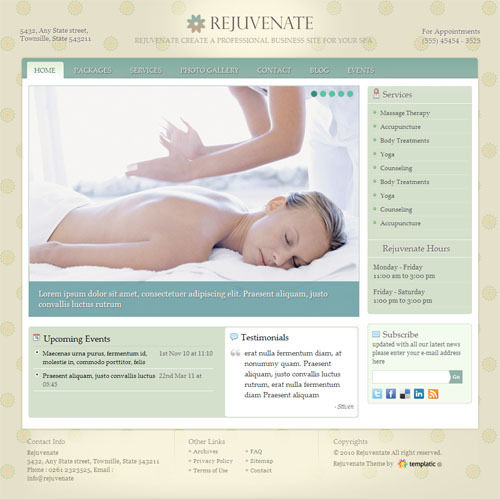 Rejuvenate is a business premium WordPress theme from Templatic ideal for health centres, spas, salons, massage or other health and service oriented business websites. The theme includes 4 alternative colour schemes, customisable homepage, custom control panel and widgets, auto thumbnails, a responsive design and more. Frisieur is a responsive WordPress theme created for hairdressers, hair salons, stylists, and similar small businesses. The theme is fully responsive and adapts to tablets and mobile screens. Some of the other main features of the theme include: an appointment form, working hours table, about us box, Google map, photo gallery, header background, unlimited colours, homepage builder and more. If you haven’t found a theme you like in the list above there are plenty of other great general business WordPress themes that would also work well. Have a look through the collections below for more themes.